OK, another set NOT new to anybody but us (well, maybe the dragon!). 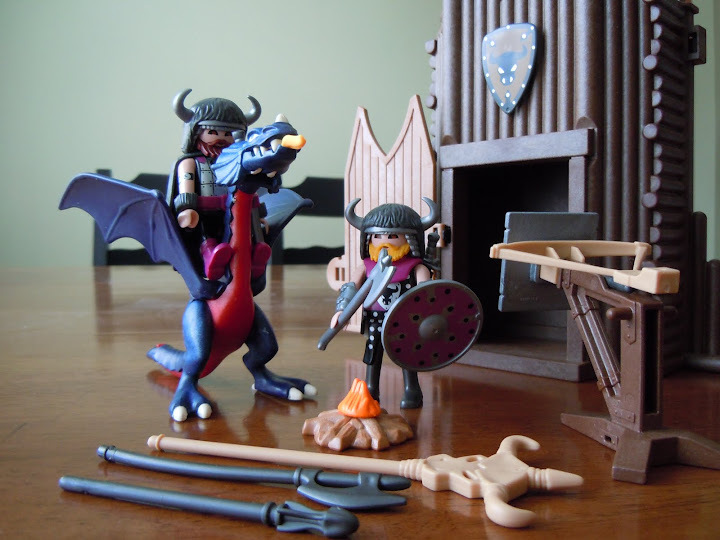 We've combined a couple of products to create a "How to Train your Dragon" playset. 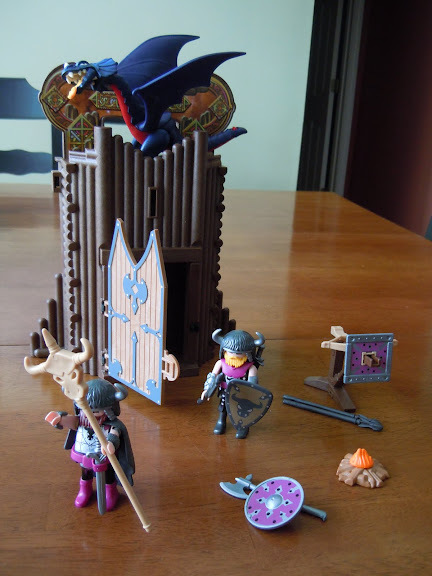 Luckily enough, the Barbarian Fort was included in the playmobil 2011 New Year's Sale for under $10. The Small Dragon is a new US playmo product at $7. Well, this has been quite the hit! Standing at approx. 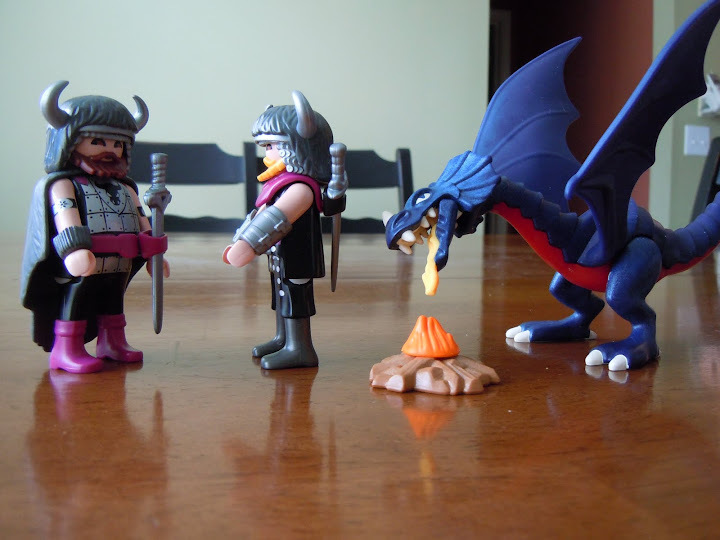 11cm tall, the dragon is just the right size for the fort. He/she can land on the top level of the fort without toppling it over. In fact, the fort is a very stable design. The dragon thoughtfully re-lights the camp fire when the embers die down. Dragon approx. dimensions: 11cm h x 15 cm l x 8 cm w. Movable legs, fixed rubberized (snap-in) wings, mouth w/fire opens and closes. The two vikings are painstakingly attired; the leader (I presume) has even a hair cape/coat that clips onto the back of his neck. Incidentally, the same hair coat mold is used for the new caveman line. They have detailed printing on their fronts indicating armor or chain mail. Each has a sword holder attachment, the leader on the front belt, the other on the back shoulder piece. Each sword is differently detailed as are the wrist cuffs on each, one has hair cuffs, the other leather/metal strap cuffs. The leader also has painted on, presumably metal, upper arm cuffs with a design. Overall, these differences make for an interesting characterization as separate yet complementary individuals. And each has his own viking hair helmet with horns. Who knew our precious little girl would love the weaponry so much, especially the working ballista (the thing that shoots long iron clad darts at enemies (or each other)! A couple of differently detailed battle axes, two ballista darts, and a long (bull's head) spear round out the armory. Also, two shields are included -- one with a bull's head logo that can clip above the fort door for clan identification. Most importantly, either viking is able to ride on the dragon's back, even the leader while he is wearing his hair coat! After all, in this story, the dragon becomes an ally! Everything except the dragon fits into the fort for storage and transport. The door does not lock but rather clips shut. This is not quite as secure for travel as the Unicorn take-along Castle doors which actually 'lock' shut in two places. Occasionally, the forest fairy arrives trying to ply her wares, but, so far, the vikings have been uninterested. Thanks for the great review tlc! And a very nice combination. I have yet to get the blue dragon but will surely get one (atleast) at some point. The Fortress was bought this summer and has many great stuff in it. Specifically the klickys are very good IMO! I come here for peace and quiet. If I’m jealous, you did SOMETHING right. Keep it up. I Support Operation Anime Storm..
A closer look at a day in the life of the dragon-loving Vikings. I think that I failed to mention in the review that the dragon's head rotates 360 degrees.